Painting the picture of Productivity requires the right Ethos and Approach: Just like Pablo Picasso.. The art of being more productive is one that has enlisted many a budding Picasso from the corporate world. Many have tried to paint the picture of their organisation’s productivity and have ended up with a variety of results; ending up with the corporate equivalent of everything from cubism, surrealism, expressionism to impressionism. Maybe putting Picasso and Monet in the same breath as the artists of corporate productivity is a bit of stretch of the imagination, but you get the idea. Every organisation has a take on how to do productivity and they all differ dramatically. If one could walk the main hall of the corporate art gallery of productivity they would well see how the “art” has progressed over time. The walls are full of the fashionable themes and colours that have all been employed in the name of getting more. Themes such as working longer hours, reducing headcounts, improved time management, staff training and new technology solutions. Add to that list process improvement, business analysis, adoption programs, change management, innovation; it’s a very busy palette of differing colours and styles and they all have been employed in one way or another. But instead of this palette being applied with the skilful application from the brush of a master, most organisations simply throw down their colours “Tom Zatar King” style at the organisational canvas. As these corporate artists tend to only dabble in this craft of productivity improvement, their results tend to be less than stellar. So why do organisations get Tom Zatar King when they really need Picasso? Where is the stumbling block for organisations to fully understand how to better extract productivity from their organisational ecosystems and avoid the heady ether of pitfalls and missed expectations? There are two reasons why I believe most organisations only achieve modest results in productivity improvement: their Ethos and their Approach. I believe that the failure of organisations to truly grasp this ethos, ultimately defines what results they will achieve. The pursuit of productivity improvements is not an “initiative” or “drive” that is performed on an ad hoc basis or as a reaction to the CFO’s current view of the balance sheet. The pursuit of productivity should be an ongoing and cyclical pursuit, driven by a cultural passion to do more. It is an attitude that needs to be lived and breathed every day by everyone from the boardroom to the shop floor, in order for it to yield a lasting effect. We have all likely fallen victim to someone’s bright idea of having a “creative ideas” or “innovation” drive. This normally involves some clever cookie (who is oblivious to reality) asking everyone to get into a room and be “creative” for a day or collect “ideas and suggestions” for the board to review next month. I don’t know about you, but finding any useful output from this type of initiative is like finding a three figure IQ at a beauty pageant, not impossible but rare. The best chance of success for improving productivity is to ensure that people have the relevant skills and then have the capacity to deploy them at the challenge at hand. The easiest way to represent this is through a framework that defines the approach for productivity skills improvement. Quorum has been assisting organisations for many years improve their skills to help bolster productivity and as such has developed a robust framework that provides this skills based context for positive change. The Productivity Skills as a Service (PSaaS) framework consists of three main “lenses” from which the painting of the Productivity skills landscape may be performed. But before a brush is put to canvas, the strategic initiatives of the organisation need to be under laid so that any proposed changes are fully in line with the organisational direction. This understanding of the strategic initiatives is something that comes from the executive leadership and needs to be woven into any plan to improve productivity in any of the lenses. This lens focuses on the relevant technical skills that people will need to have to make the best use of any technology platform that underpins productivity improvement. This is necessary as many Productivity initiatives have a technology that requires user competence in order for it to become useful to people. 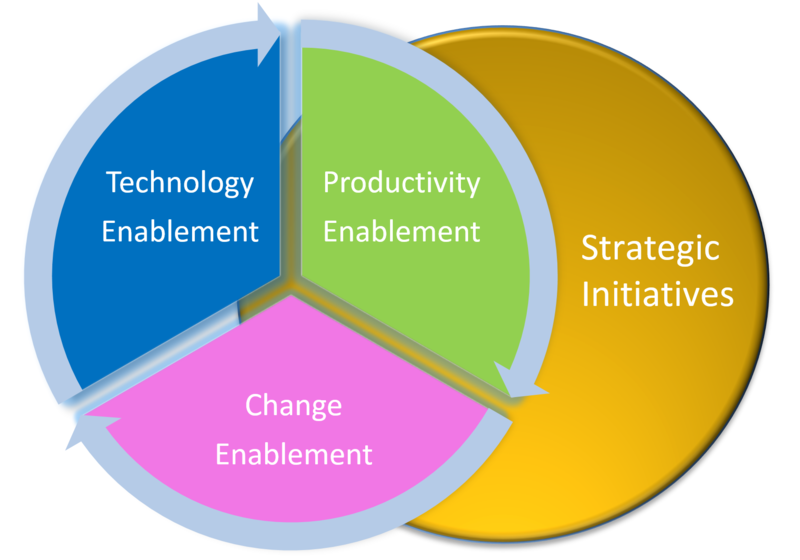 Technology Enablement takes the form of end user training on the relevant technology (i.e. software skills). This lens has its focus on the skills needed to establish the right approach or methodology for productivity improvements to be best had. The types of skills that may be brought to bear in this area are skills such as Getting Things Done (GTD) Theory, Holacracy, Design Thinking and an array of Soft skills to best bolster one to tackle the productivity equation. For example GTD theory drives the importance of time management principles and skills into people’s daily routines. Having the best technical skills in the world is of no use unless you have the capacity to deploy them effectively. Utilising GTD and Holacracy techniques allows one to better arrange their competing task priorities and helps them filter for what is most important. Thereby being more productive over time with things that occupy your day such as meetings, decisions and the like. In addition Design Thinking and its outputs has the capacity to produce step function changes in productivity through innovation. Design Thinking should be viewed as much more than just a task or process, but an attitude. Design Thinking skills allow people to employ their creative energies to help improve the collective Creative Quotient or “CQ” of an organisation. By improving the overall CQ of an organisation, new ideas can begin to surface and the probability of productivity improving in radical ways is greatly increased. Many other soft skills can be added to this lens to further reinforce people’s skillsets and help them to be more productive. Supplemental capabilities such as negotiation skills, presentation skills and leadership all have their place on this palette. This lens focuses on the people and process aspects of Change and how they need to be incorporated as part of any productivity improvement program; this lens is likely the most challenging for businesses to get right. The challenge with this part of the framework is that it contains the most change averse of machines and their subsequent serfdom to habit: People. Change Management is fast becoming the new black in corporate transformation program initiatives; as business try to make sure that they cover as many bases as possible with the people element of their transformation initiatives so as to reduce the inertia and resistance to change. By creating a structured approach for fostering employee understanding, ownership and contribution toward the change initiative, brings the human element along for the transformational ride at all levels of the organisation. Any way you look at it the people variable is a key part of the success criteria of the change equation for any transformation initiative. To compound the impact, many change initiatives that introduce new technology, platforms, skills or methods may also require a readjustment (or removal) of existing business processes that people interact with. Being able to change the way people do things to best align with the new world from a business process perspective is the other side of the change management coin. By working through the vicissitudes of any productivity initiative as one looks through these lenses, a picture may crystalise that productivity could indeed be painted by numbers. Potentially a single number, lets call it the Productivity Quotient or “PQ”. An individual’s or an organisation’s productivity effectiveness could be measured by this PQ and then post any initiative, project or transformation it could be remeasured, thereby producing a delta. Harry is a typical corporate employee. He has a basic level of technical competence with his companies systems, a low to poor level of productivity skills and has had only minor exposure and input to his organisations previous strategic and project based transformation initiatives. Lets calculate Harry’s benchmark rating of PQ by utilising 10 as the highest rating and zero as the lowest rating. Now by placing Harry into the Productivity Skills as a Service Framework and creating a structured customised program for improving his technical skill with ongoing training (i.e. office365), his productivity skills (i.e. GTD Time Management, communication, design thinking and teamwork) and engaging him in the process of Change. By improving Harry’s capabilities and his ability to apply them to any business initiative, he has now become more productive in his corporate ecosystem. An ROI could even be calculated for someone like Harry based on their time utilisation and or key indicators of their output to further validate their productivity on a balance sheet. Having a spherical understanding of these interrelationships of corporate strategic initiatives, people and process as part of any productivity program, is the key to laying the groundwork for productivity success. By observing the process of productivity improvement as an equation whose variables include technical skills, productivity methods and change governance structures; will provide the best possible environment for any productivity improvements to thrive across each and every business operation they are applied to. Quorum’s PSaaS framework of cyclical education and enablement for productivity as an ongoing and integrated program or service, will set the scene for the best possible chance of painting (even by numbers!) 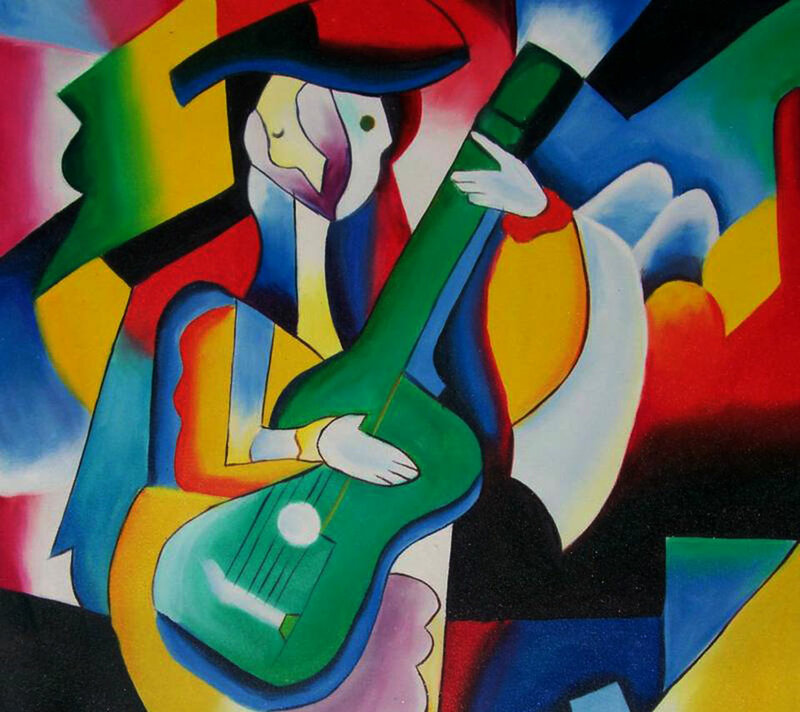 your organisation’s productivity portrait like Picasso! CIO survey says Azure is catching AWS fast – McLaren F1 vs Bugatti Veyron ?